This page is dedicated to the science, policy, and the legitimate scientific debate about global warming and climate change caused or contributed to by greenhouse gases accumulating in the atmosphere at unnatural rates from human economic activity at a modern industrial scale. This is also referred to as anthropogenic global warming (AGW). The purpose of this page is to foster the translation of sound global warming science into sound global warming and climate change risk management policy for a sustainable future and effective, efficient, and reliable programs, projects, and technologies for the reduction and offset of greenhouse gas emissions to civilization-sustainable levels as soon as possible. This is the moment when one has to choose to be a climate change Winston Churchill or Neville Chamberlain. The former is a historical hero of WWII who predicted the unqualified, imminent threat posed by Hitler to free peoples everywhere, did everything in his power to prepare Great Britain for the inevitable world war with fascism, and then led the allies to victory over expansionist, fascist Germany, Italy, and Japan. The latter is a historical dupe who was charmed rather than alarmed by Hitler and the unqualified, imminent threat he posed to our way of life. The longer we wait to act meaningfully to reduce the emission of carbon dioxide and other greenhouse gases from the production, use, and disposal of fossil fuels on a modern, industrialized scale to safe rates*, the more otherwise avoidable impairment, damage, debilitation, and death that will be caused by sea level rise, ocean acidification, and climate change that results in increased incidence of extreme weather events. To paraphrase Patrick Henry, if this be alarmism, make the most of it. *A safe emissions rate for greenhouse gases of human economic origin ensures that we can effectively manage the consequences of unnatural rates of sea level rise, ocean acidification, and increases in the magnitudes, durations, frequencies, and extents of extreme weather events and is dictated by the Earth's solar-powered carrying and assimilation capacities for greenhouse gases of natural and unnatural origin, not economic dogma. This is an all-of-the-above strategy you can believe in. If you want to jump right in on the details of AGW, here’s a link to the Global Warming Handbook produced by the Worldwatch Institute. The Washington Post article linked above is a distillation of the summary of the 5th Assessment Report on Climate Change by the United Nations-sponsored Intergovernmental Panel on Climate Change inked below. While there is scientific consensus that unnatural global warming is being caused by the unnatural rate of emissions of greenhouse gases of human economic origin, also known as anthropogenc global warming (AGW), there is not yet scientific consensus on when, where, how and to what degree climate change caused by AGW will occur. Unfortunately for us, the climate scientists have likely under-predicted, not over-predicted the rate and adverse consequences of ADW. For example, the net melting of the Antarctic land ice is occurring three times as fast as previously measured or modeled, even though the sea ice has increased to levels not seen since 1979. The Arctic polar ice cap continued to melt at an unprecedented rate. This wa snot offset by any increase in the Arctic Ocean ice cover. 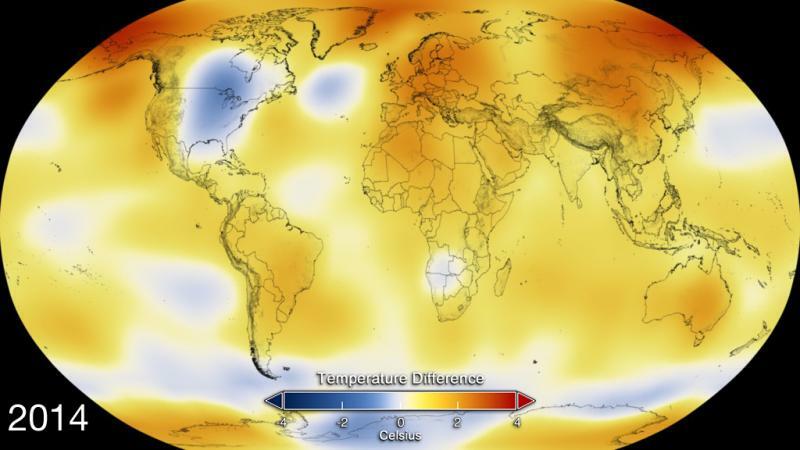 The year 2014 AD was the warmest year on record. Here are the most disturbing things we learned about anthropogenic global warming in 2014. According to the United Nation’s Disaster Management Agency, global warming is likely to increase both climate and weather extremes, including droughts, floods, windstorms, and tidal surges. There is no evidence of global cooling over the last 15-20 years, only a slowing in the global warming to around +0.6 to +0.8 degrees Celsius above the long-term global average over the reliably measured period of record. 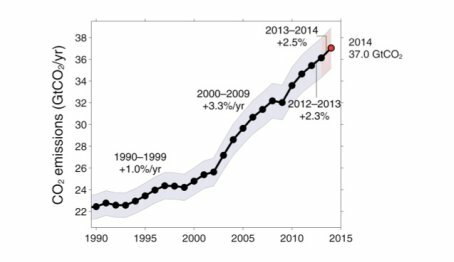 The emissions of carbon dioxide from the combustion of fossil fuels by modern human economic activity is making an increasing contribution to the Earth’s carbon and thermal energy budgets over time. The excess heat from solar energy trapped by the excess carbon dioxide in the atmosphere over the last 15-20 years had to go somewhere. That somewhere is most likely the deep oceans that are warming faster than previously believed as our monitoring networks expand and more accurate measurements are taken. 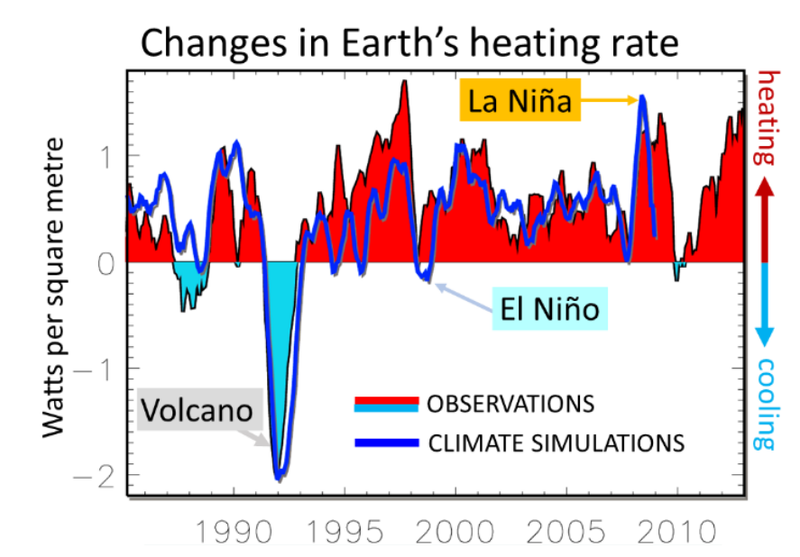 The models that predicted this hiatus in the rate of global warming increase also predicted the hiatus in the El Nino phenomenon as a consequence of the cooling of the Pacific Ocean in response to a more rapid mixing of warm surface water and cold deep water, most likely because of the increase in the average speed of the wind roughing the ocean’s surface. The occurrence of record-setting cold-snaps and snows anywhere is not proof that unnatural global warming is not occurring or that the Earth is cooling. Our climate scientists and climate models have predicted that AGW will cause or contribute to increases in record-setting weather extremes, including unprecedented warm-ups in the dead of winter and cold-snaps in the heart of summer. In the winter of 2014-15, the record cold and snowfalls in the USA Midwest an Eastern Regions were accompanied by record-setting warm-ups in northern Alaska and the center of the country. That great a change in temperatures over that small an area suggests that highly unsettled weather along the front between those two extremes. In fact, there was an unprecedented outbreak of tornadoes along that front in the Southeast Region in January 2015. 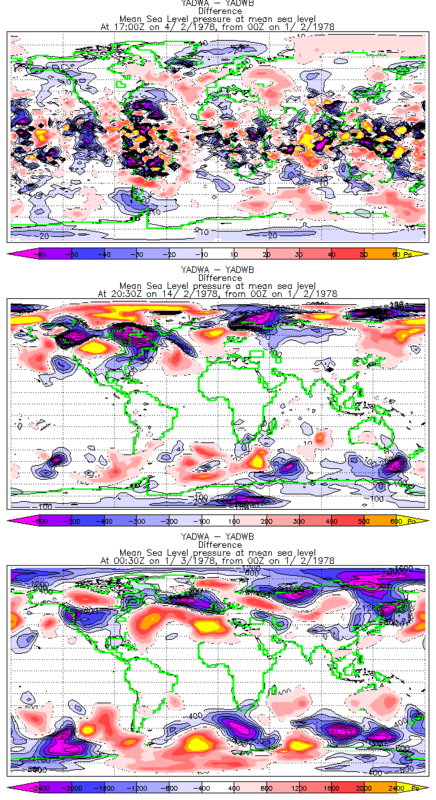 That is our weather future on AGW. That is a cause for alarm, not complacency. 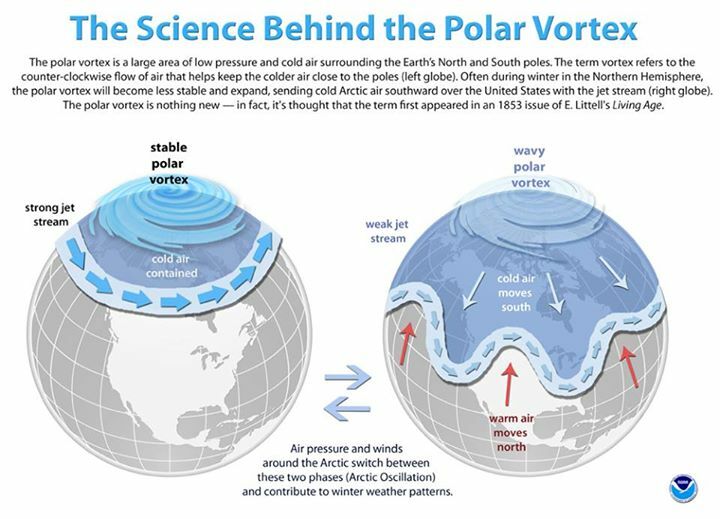 These winter weather extremes across the USA can be explained by the unnatural wanderings of the jet stream and the polar vortex that it steers. 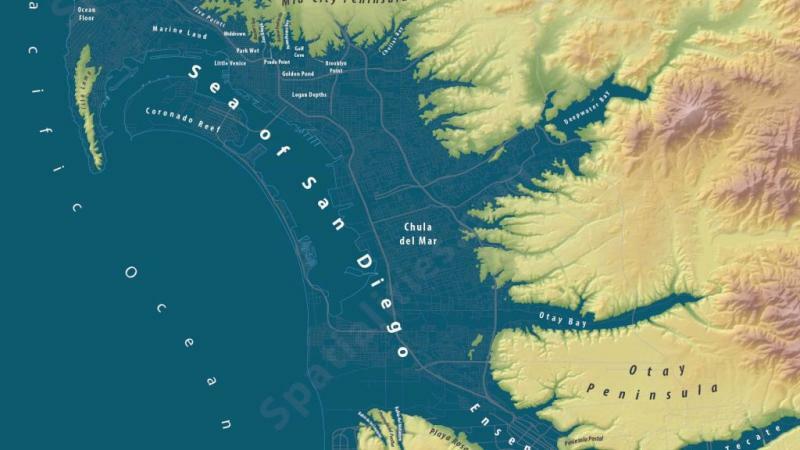 This is what our coasts will look like as the Arctic and Antarctic land ice melts under the influence of global warming. For obvious reasons the insurance industry is now taking climate change caused by global warming of human economic origin seriously, and so should we. The USA’s Department of Defense (DOD) has begun to turn to alternative energy sources to shorten its energy supply lines in war zones, because the longer those supply lines, the greater the risk of attack and loss. In addition, the Pentagon is now planning on responding to widespread global political instabilities and military risks due to the stresses and strains placed on societies, economies, governments, and financial institutions at every scale from sea level rise, ocean acidification, and the reasonably anticipated increase in the magnitudes, durations, and frequencies of weather and climate extremes caused by the known increase in atmospheric carbon dioxide of human economic origin. The good news is that, according to a Fall 2014 Yale University survey, most Americans now support greenhouse gas emission reductions to prevent or mitigate climate change caused by global warming of human economic origin. This is contradicted by a poll that found 57% of Americans still do not believe that climate change caused by global warming of human economic origin is a serious threat to their way of life. The bad news from that same survey is that only about 10% of those interviewed believe global warming should be a priority political issue. The worse news is that the belief or disbelief in climate change caused by global warming of human economic origin is primarily determined by one’s political orientation, not one’s perception of or experience with actual warming trends or unusual weather events. The best news is that the Earth will respond more rapidly than previously thought to policy measures to reduce carbon dioxide emissions using regulations and incentives and mitigative measures like the large-scale replanting of forests. According to the layman's summary of the 5th Report of the International Panel on Climate Change sponsored by the United Nations, climate change caused by global warming is now irreversible. The question is no longer whether it will happen but when, to what extent, and with what reversible and then irreversible disruptive effects on human economies, societies, and law and order at every scale. The longer we wait, the worse things will get, and the less we will be able to do to prevent the worst case and its consequences. This is just like a cancer that was detected early but left untreated, because the patient is in denial, believes the doctors are out to profit from the treatment of this non-existent disease, or fears the treatment more than the disease and turns to herbal tea and faith healing, until the symptoms are obvious even to the patient. By then it is too late to do anything but plan who will be invited to the patient’s bedside for the last goodbyes and the memorial service to follow. That is our future on unregulated greenhouse gas emissions, and that is no future at all. It is way past time to take our medicine, cure the diseases caused by our addiction to fossil fuels and unlimited growth and development powered by those fossil fuels, and get on a schedule of rehabilitation to recover as many of our higher order faculties and functions as we are able. Our understanding of the causes and effects of unnatural climate change from unnatural global warming caused by the unnatural rate of release of carbon dioxide and other greenhouse gases of human economic origin on a modern industrialized scale continues to advance. 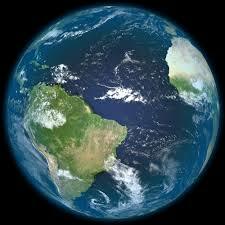 This is as a result of ground-based and satellite-based monitoring, laboratory and field research, and computations in the form of computer models that simulate the causes and effects of global warming. These studies are being conducted by government agencies and government grants to academic institutions.﻿ The private sector is also actively engaged in this area of scientific inquiry, especially research and development for greenhouse gas emissions capture technologies and aletrnative energy technologies. The scientific method is a logical, unbiased, self-correcting, systematic process for transforming data from measurements of the natural world into information, information, into knowledge, and knowledge into understanding via analysis integration, and synthesis to develop, test, and accept or reject increasingly general and unfalsifiable hypotheses about the relationship between cause and effect that are eventually promoted to the status of theories and unfalsifiable theories eventually promoted to the status of laws of the universe that are always obeyed by everything, everywhere, at all times. 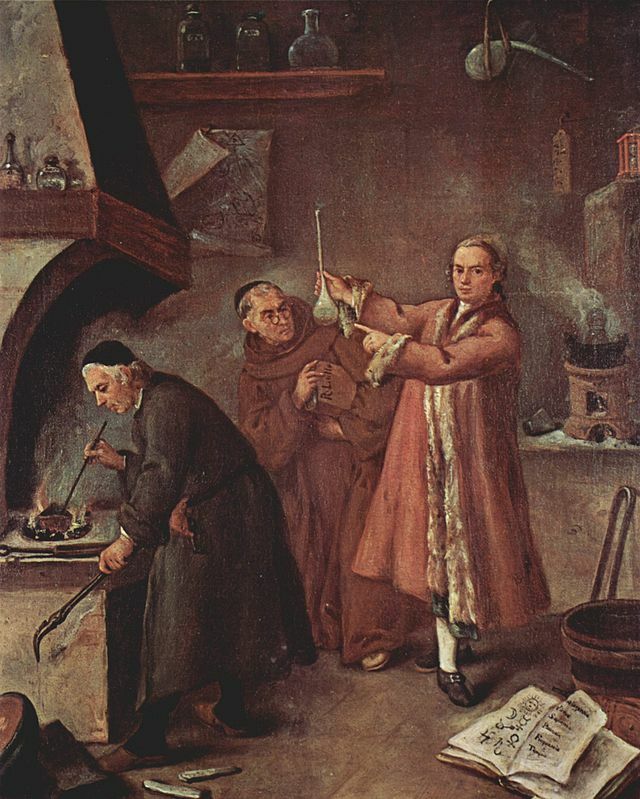 There is a covenant between science and tool-making humankind that the power, sophistication, and usefulness of its tools will advance in proportion to the scientific knowledge accumulated if the scientists are allowed to conduct and exchange information about the pure and applied research they conduct in the free market of ideas governed only by the rules of science. Throughput its history science has never failed humankind in this regard, but humankind frequently fails science by allowing politics or religon to influence the scientific process. In the context of that covenant, what follows is a reconstruction of the key scientific discoveries that allow us to calculate the solar heating of the Earth and the effect of an unnatural increase in the concentrations of natural and unnatural greenhouse gases of human economic origin on natural and unnatural global warming. 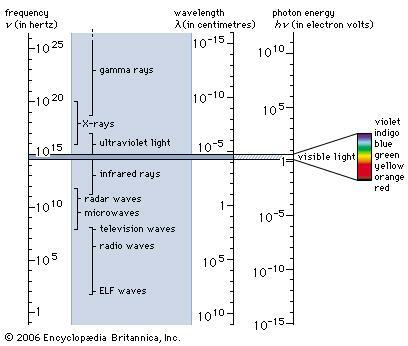 Sunlight is composed of a mixture of wavelengths of radiation from the electromagnetic (EM) spectrum. 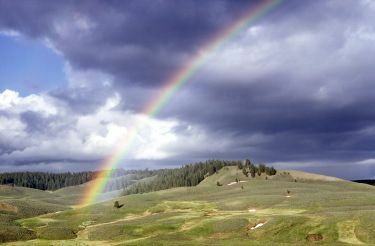 ﻿The bending or refraction of sunlight by the prism of the raindrops suspended in air to produce the rainbow is governed by a law of nature first discovered by the research of Christian Huygens and Isaac Newton. 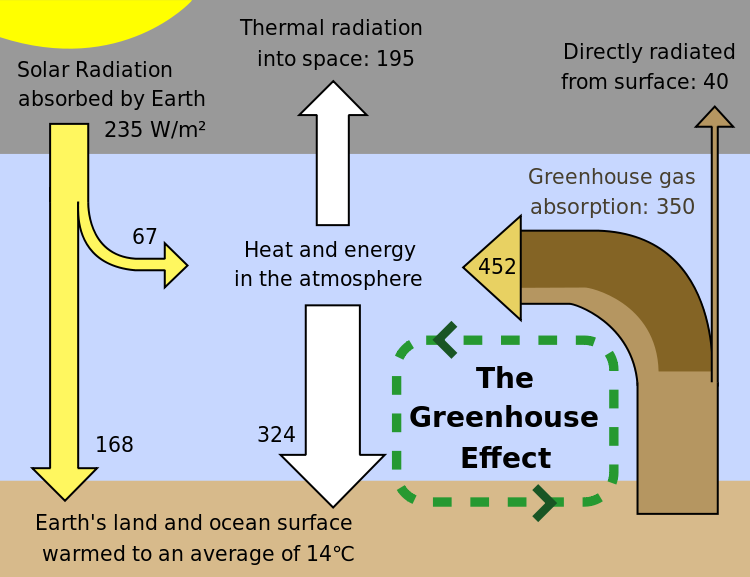 In the 1820s Joseph Fourier hypothesized that the gases in the atmosphere exerted a greenhouse effect that regulated the Earth's average temperature by regulating its thermal energy balance. John Tyndall isolated carbon dioxide in the atmosphere and studied its absorption and emission of EM radiation from the solar spectrum. He concluded that carbon dioxide was making a substantial contribution to the atmosphere's greenhouse effect﻿. Lord Rayleigh refined our ability to measure and calculate the absorption, emission, and scattering of radiant energy by the suspended particles in the atmosphere and the individual elements and compounds of which it is composed. ﻿Sunlight and heat are both composed of mixtures of wavelengths of EM radiation. For each source there is a set of characteristic wavelengths with associated characteristic intensities across the EM spectrum. 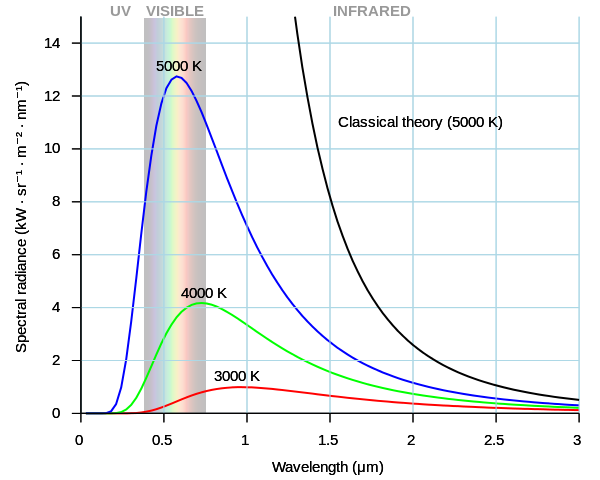 The depiction or graph of intensity for each wavelength of EM radiation is the probability distribution function (pdf) for the EM spectrum of that source. The hotter the source, the more the pdf is shifted to the left in the graph above to greater intensities for the shorter wavelengths of light with greater individual energies. The ability of Max Planck to calculate the EM radiation spectrum pdf emiitted by a sources as a function of its temperature was the first triumph of the emerging quantum mechanics at the turn of the previous century. For the hot surface of the sun, the solar energy is shifted to the shorter wavelengths of the EM radiation spectrum with more visible and ultraviolet light. For the cooler Earth, the EM radiation spectrum pdf is shifted to greater intensities of longer wavelengths of infrared (IR) EM radiation. If the pure material or mixture through which light passes absorbs or scatters one or more of the wavelengths of which it is composed, the intensity of light that emerges is reduced or attenuated relative to the light entering in logarithmic proportion to the intrinsic absorption or scattering efficiency of each component of the pure material or mixture for that wavelength of light, the concentration of the absorbing or scattering element, compound or particle, and the distance or path length through which the light passes. This is the Beer-Lambert Law. Using traditional and then satellite measurements, the structure and composition of the Earth's atmosphere is known with great accuracy at high degree of scientific confidence. 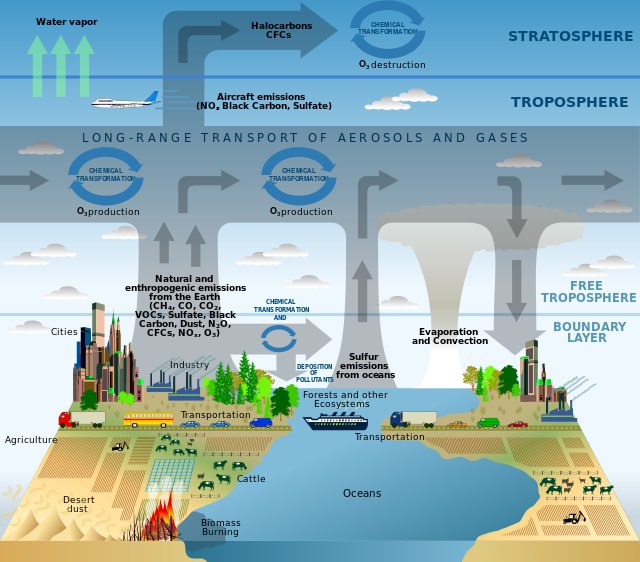 The chemical composition of the Earth's atmosphere is determined by a combination of natural physical, chemical, and biological cycles occurring in natural balance. The chemical composition of air and the physico-chemical properties of each of its major and minor constituents are now known with a high degree of accuracy, precision, and level of confidence in the results as a scientific certainty. These properties include the degree to which each absorbs and emits the various wavelengths of light in sunlight and the long-wave light spectrum emitted by warm Earth surfaces. ﻿Scientists can then reverse this reductionist process and reconstruct the combined physico-chemical properties of the mixture of gases in each layer of the atmosphere under natural conditions of incoming solar radiation and outgoing thermal radiation by summing the contribution from each in its measured concentrations, taking into account its interactions with itslef and the other constituents at those temperatures and pressures. The difference between the thermal energy absorbed and emitted in each layer determines the net thermal energy deposited in each layer and the associated temperature from the heat capacity of that layer at its appropriate pressure. This is the basis of the steady-state climate models. This systematic process uses a great deal of computer capacity and time, but it is not impossible and its results are not inherently untrustworthy. 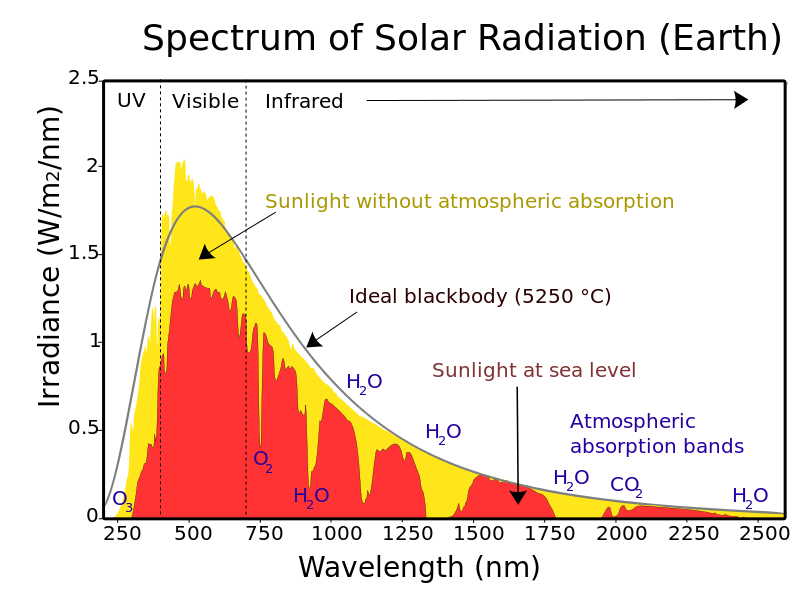 Depicted below are the incident solar energy spectrum and the solar spectrum attenuated according to the Beer-Lambert Law ﻿by the absorption and scattering of its various wavelengths by the suspended particles and elements and compounds in the mixture of gases that make up the atmosphere. The physical behaviors of liquid and gas fluids in the atmosphere are governed by the equations of fluid mechanics. If one doubts their validity as a consequence of the various assumptions that are made in their derivation or their success in their various applications, then do not surf, ride down a water slide, fly in airplanes or rely on weather models to guide your evacuation risk management decision-making. The warmer periods in the Earth's history are generally associated with higher carbon dioxide concentrations in the atmosphere, most likely from the eruption of volcanoes and the opening of thermal vents on the ocean floor. Some of that excess carbon dioxide was captured by plants and transformed into organic matter and then slowly converted into fossilized carbon coal, oil, and natural gas over millions of years. 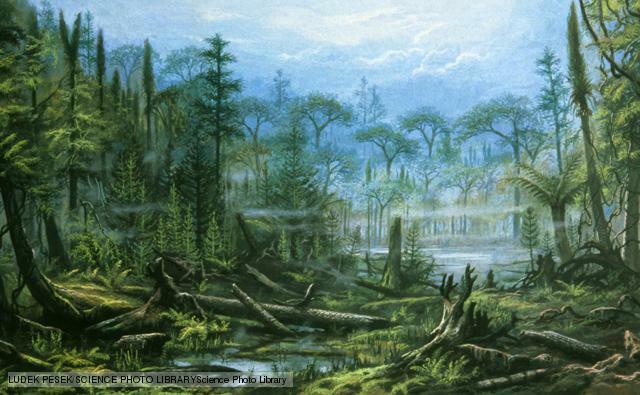 The most abundant sources of fossilized carbon are from the Carboniferous Period that began about 350 million years ago. That the liberation of a substantial fraction of this fossilized carbon dioxide at exponential rates by industrialized human economic activity over only a few hindred years could cause AGW was first hypothesized at the turn of the previous century by the Nobel Prize winning physicist/physical chemist, Svante Arrhenius. Subsequent claims that carbon dioxide IR absorption is saturated and could not regulate the Earth's thermal energy budget were systematically disproved by a series of laboratory experiments and atmospheric measurements using the then state-of-the-science of monitoring sondes carried into the atmosphere by balloons. None of these scientists were stooges for or dupes of alternative energy advocates, because most of the critical science was done and settled prior to their births. Nor are these same scientists stooges for or dupes of Socialism, Liberalism, or Environmentalism, because many of them also did war-related research during WWI and/or WWII. By the 1960s concern was growing among an increasing number of geophysicists that the emissions of carbon dioxide from fossil fuel combustion at unnatural rates at an industrialized scale could eventually cause unnatural global warming from human economic activity. ﻿This is also known as anthropogenic global warming. Our ability to quantify and model these causes and effects has improved many times over since then, because science continues to fulfll its covenant with civiilized humankind. The introductory college chemistry text from which I taught in 1973-74, Masterton and Slowinski, contains a chapter on the chemistry of the atmosphere and a section on unnatural global warming caused by the unnatural accumulation of carbon dioxide in the atmosphere from human economic activity on an industrial scale. Unfortunately, time did not permit teaching applied atmospheric chemistry. Textbook science is generally considered settled science. The cumulative weight of scientific logic, evidence, and computation accumulated over the last 200 years since Fourier supports the hypothesis that anthropogenic global warming is occurring beyond reasonable scientific doubt. The increasing accuracy of our satellite measurements and the increasing power of our computer models underscore and do not contradict this hypothesis. The carbon dioxide in excess of pre-industrial background levels is trapping excess thermal energy for the Earth's thermal energy budget beyond reasonable scientific doubt. Where the excess thermal energy caused by AGW goes and what damages the excess entropy flux in the climate system has done, is doing, or will do in the future is not established beyond reasonable doubt, and, even if our climate models behaved flawlessly, there is an irreducible uncertainty associated with the inherent chaotic behavior of climate and weather due to the solar-heated fluid mechanics of the atmosphere and hydrosphere. The weather and climate are both chaotic, not random, but weather is always more chaotic than climate, because climate averages out the short-term chaos of the weather over long periods of time. It is a challenge but not impossible to discriminate natural from unnatural chaotic behavior under the unnatural influence of the unnatural excess entropy flux from the unnatural excess thermal energy trapped by the unnatural excess carbon dioxide in the atmosphere. The existence of this irreducible chaotic uncertainty in the climate is not cause to snort in derision and do nothing or too little, too late, because the same natural chaos in the undisturbed pre-industrial climate is the same chaos that, under the perturbation of the excess entropy flux from the excess thermal energy trapped by the excess carbon dioxide in the Earth's atmosphere, can reach an inflection point beyond which the climate will destabilize, wobble around for awhile, and them restabilize around a more chaotic focal point (attractor) with inherently more chaotic weather. It is because we don't know when we will reach that climate change breakpoint, how long and how badly the climate will wobble, and how bad it will be when we finally reach the new thermally excited climate steady state that we must act now to plan, design, and construct for the worst case and hope for the best case, not vice versa. The cumulative weight of scientific logic, evidence, and computation is now sufficient for EPA to issue an emergency declaration for the emission of greenhouse gases under the Clean Air Act as an imminent threat to the public health and welfare. EPA's authority to issue such a declaration and its reasonableness in light of the state-of-the-science of global warming have been adjudicated in EPA's favor all the way to the Supreme Court. It is also probably sufficient to convict the Koch Brothers and others similarly situated[http://drexel.edu/now/archive/2013/December/Climate-Change/] more likely than not of being criminally liable for the otherwise avoidable loss of life, limb, and property from their gross negligence and conspiracy to defraud through their worldwide disinformation campaign to convince us that there is a global warming hoax. The remaining question is not whether AGW is occurring but what is the mature, sober, responsible, adult thing to do about it that is in the best interest of the public health, safety, and welfare in the face of the remaining uncertainty about the future of climate change causes and effects. That is the adult conversation that we should be having about the growing environmental debt we are leaving to future generations. We damn rivers and drain swamps to generate electricity and avoid floods for future generations. There is no reason not to show future generations the same courtesy and avoid AGW by slowly divesting from an over-reliance on fossil fuels and spreading our future risks by diversifying our power portfolio over the next 50 years. Such an orderly transition has been laid out by climate scientists from Stanford University. Copyright 2015 Waterwise Consulting (TM), LLC. All rights reserved.